where will all the turbines go? This year’s annual Scottish Planning and Environmental Law conference included an enlightening session on the new policy framework created by Scottish Planning Policy (SPP) for onshore wind turbines. That seems clear and sensible. But it quickly starts to get muddy, as demonstrated by the example of South Lanarkshire used at the conference. When those parts of South Lanarkshire with potential for wind farm development are mapped, the area is minimal. 2km buffer zones around towns and villages remove almost the entire “area with potential for wind farm development” north of Douglas and Biggar, while much of the remoter area south of those places is prohibited by a combination of buffer zones and other designations. Okay, you might say, the area for potential wind farm development might not be big, but at least it’s clear that wind farms can be developed there? Unfortunately not. SPP also identifies 19 criteria (paragraph 169) that planning applications for wind turbines must be assessed against. A planning application could be refused on just one of those 19 criteria. From the point of view of the wind farm developer (which might be a community group) or an investor assessing the likelihood of securing planning consent, what might have seemed a straightforward ‘Group 3’ site in policy terms might now seem a rather riskier proposition. Using that example of South Lanarkshire – a large local authority area with a mix of urban, rural and upland areas and without any National Parks or National Scenic Areas that would automatically prevent wind farm development – the ‘potential’ areas for development now seem rather more limited than the clarity of new SPP spatial framework might initially imply. This isn’t just a dry policy debate. It has real implications for climate change. 100% electricity demand equivalent from renewables by 2020. At least 30% overall energy demand from renewables by 2020. 500 MW community and locally-owned renewable energy by 2020. According to the government’s most recent progress update in 2013, one of the challenges for the future development of onshore wind is “continuing to engage with communities to ensure that public support for onshore wind projects is maintained” – implying that more onshore wind turbines are required to meet the Routemap’s targets. Extrapolating from the South Lanarkshire example, the limitations imposed by SPP’s 2km buffer zones around settlements and 19 assessment criteria severely constrain the locations that can be developed. 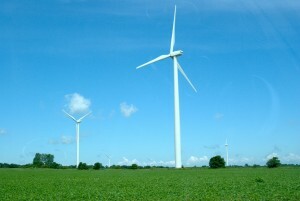 Where will will future wind farms go? But the problem is not just location: the cost and delay associated with justifying proposals against those 19 criteria will inevitably act as deterrents for developers (particularly local communities) and investors, especially as the Feed In Tariff (FIT) rates for new turbines reduce over time, reducing the potential income (and therefore viability) for small community or local developers. This raises real questions: will turbine developers continue to come forward with proposals to meet the government’s ambitious targets? And will they be able to secure investment funding from banks and lenders as income drops and risk increases? For years, views have been polarised about wind turbines. Some people don’t mind them, others detest them. Whatever your viewpoint, they are an important part of how the Scottish Government will meet its climate change targets. The community benefit angle, as exemplified by two similar single turbines on the adjacent islands of Coll and Tiree – one developed by the community, one not – one loved by the islanders, the other not. All this implies to me that we need to get much smarter about how we plan for onshore wind if it is to meet the expectations of the Scottish Government. Think of mobile phone masts: they were massively controversial fifteen years ago, much less so now as attitudes change. We need to move the debate forward about turbines. They are still controversial, but many people are more accepting of them now than a few years ago: the silent majority, possibly? Who knows. But maybe planning policy needs to recognise that change in attitudes, and play its part in leading the debate forward positively. Thanks to Michael McGlynn of South Lanarkshire Council and Euan Hutchison of Natural Power for their contributions to the conference which stimulated this post. Don’t blame them if you disagree with my conclusions – I take full responsibility for the content of the post. urban ‘hygge’: lessons for Scotland?